Pura Vida! Costa Rica’s cry of “Pure Life” booms a greeting from locals to visitors from abroad. Best known for its rich biodiversity and ecotourism, Costa Rica is also ranked as one of the happiest countries in the world. It boasts some of the finest coffee money can buy and is the investment destination of choice for services in Central America. For South Africans, Costa Rica offers one of the more interesting models for African countries seeking a workable balance between development and the environment. By LYAL WHITE. October was a big month in Costa Rica. The country qualified for the 2018 Fifa World Cup finals in Russia for a fourth time in the last five Fifa World Cups. No mean feat for a country with less than five million people. Tropical storm Nate claimed 11 lives and displaced over 11,000 people. It was declared the biggest natural disaster in Costa Rica’s recent history. And finally, 7 October marked the 10-year anniversary of the famous Central American Free Trade Agreement (CAFTA) referendum in Costa Rica. This sought an expansion of the North American Free Trade Area (NAFTA) to five Central American countries and the Dominican Republic. The “yes” vote, in favour of the expansion, won the referendum by a marginal 1%. Those opposed to expanding Costa Rica’s free trade agenda have gone as far as to suggest that globalisation threatens the “social contract” and culture of environmentalism, the “Pura Vida” of modern-day Costa Rica. Despite a “yes” victory, the referendum split the country and marked the start of a subtle re-aligning of Costa Rica’s internationalisation and commercial agenda. This, many say, has disrupted the political system and may threaten Costa Rica’s successful economic model built on openness and connectedness, imbued with the core values of social progress and conservation. Costa Rica was the poorest and most neglected of the Spanish colonies. With no real wealth in the form of gold and silver to speak of, Costa Rica emerged as a banana and pineapple republic. But herein lie the origins that distinguish Costa Rica from the rest. “Costa Rica has a history of 200 years of good decisions. From day one we had poor people doing the right thing for society and creating institutions unlike anywhere else in Latin America,” says Victor Umana, Director of the Latin American Center for Competitiveness and Sustainable Development at INCAE, a leading business school. Costa Rica’s foundation is built on a history of economic and political stability. With over 120 years of democracy and no army since 1948, Costa Rica boasts of being one of the longest running democracies and safest countries in the Americas. This has allowed them to focus resources and efforts on building a highly skilled and healthy workforce. Education and healthcare receive 7.4% and 10% of the Gross Domestic Product (GDP) respectively – well above the regional average, even though Costa Rica’s healthy workforce is 98% literate. Human capital is undoubtedly Costa Rica’s greatest asset, allowing it to grow and diversify well beyond agricultural exports. The country is harvesting talent to service the entire region. There were apparently more Costa Rican engineers working on the expansion of the Panama Canal than any other nationality. But agriculture, at 27% of exports, still accounts for the lion’s share of Costa Rican trade with the rest of the world. And nearly half of all exports go to the US and Canada. Apart from bananas and pineapples, coffee is a major export. Costa Rica has made a concerted effort to maximise the value of this over-traded commodity. Since 1992, by law, only the Arabica variety of coffee is grown across the country. This has resulted in some of the highest quality and most sought-after coffee beans in the world. But the real challenge for Costa Rican coffee producers, like their counterparts in Africa, is in capturing as much of the java value as possible. Conventional trading of green beans will fetch roughly $3.30 per kg. This number will increase to nearly $20 per kg once roasted and bagged for retail. But the real multiplier comes from espresso sales. At roughly $3 a shot, a kilogram of coffee produces around 120 espressos. That comes to $360 for the same kilogram of beans sold. Apart from margins, value addition through processed products and services generates up to eight times more jobs than traditional farming. Costa Rica is an outlier in the metrics of human and sustainable development. At $58-billion, its economy is roughly the size of Kenya or Ghana, and one fifth the size of South Africa. With a much smaller population, the average Costa Rican is 10 times as wealthy as the average Kenyan and double that of the average South African. But it is on measures of social progress and environmental impact that Costa Rica truly punches above its weight. Like many developing world counterparts, Costa Rica is categorised as a country with a “high human development” count, ranking 66 out of 188 countries on the United Nations Human Development Index (HDI). Costa Rica’s impressive 12th position on the 2017 World Happiness Index places it well above other developing countries in a similar income bracket. South Africa ranks at 101st position on the Happiness Index. Results on the HDI reflect a similar trend, especially when it comes to the environment. In Costa Rica, forests make up 54% of the total land area compared to just 7.6% in South Africa. And carbon dioxide emissions per capita and renewable energy consumption as a percentage of total energy consumed stands at a stellar 1.6 tonnes and 38.6% respectively. South Africa’s carbon dioxide emissions have risen to 8.9 tonnes per person and just 16.9% of the national energy consumed is renewable. Costa Rica is not without its challenges. A once seemingly flawless political system is showing signs of fatigue. With an array of divergent parties jockeying for limited political space, hairline cracks in a traditional two-party system that now houses nine competing parties in congress are starting to appear. It is little wonder that increasing bureaucracy and policy paralysis are frequently mentioned as growing constraints to doing business. Ironically, this tends to impede local business more so than their multinational counterparts who are able to circumvent increasing red tape. Fuelling political fragmentation, the bottom 15% income bracket of the population seems to be structurally excluded. This group, which feels it has not benefited from an open and modern Costa Rica of back-office services and call centres, has seen a substantial growth in the informal sector. Overall, informality has ballooned from around 10% of the economy to over 40% in the last 15 years, and accounts for over 80% of employment in this lower income bracket. Apart from impressive social and environmental indicators, Costa Rica has also altered its investment and export model. The story of Intel in Costa Rica is an illustration of its modernisation and evolving economic model. In 1997 Intel set up an advanced light manufacturing facility, a real game changer for the country at the time. Intel was lured by favourable investment incentives, along with a highly skilled and low-cost work force. But in 2014 Intel closed its Costa Rican manufacturing operation, maintaining a research and development facility instead. While labour costs in Costa Rica have risen substantially over the past 10 years, a dramatic shift to mobile devices is largely to blame for this decision. Marta Equival of Procomer, the semi-independent export agency that administers Costa Rica’s free trade zone, insists that the move by Intel did not necessarily undermine manufacturing output and employment in the country. Rather, it delivered an unexpected opportunity to diversify. Intel, she says, accounted for 25% of Costa Rican exports in 2013. Today that figure is represented by 60 different companies that have taken advantage of expertise built by Intel and are exporting medical devices, biotechnology and, increasingly, services. While 10 products account for 51% of Costa Rica’s exports, traditional commodities like pineapples, bananas and coffee now represent 14% of total exports compared to 60% in 1990. Costa Rica’s real growth in exports and investment is in services. And while back office call centres were the story 10 years ago, today these services span medical tourism and specialised business and financial services. Costa Rica is also positioning itself as a destination for scientific and engineering testing, yet another sophisticated economic multiplier. Having taken a pragmatic ‘inside-out’ approach to addressing societal needs in the context of the environment decades ago, Costa Rica established a unique competitive advantage and positioning among its peers grappling with similar challenges of development and delivery. Innovative approaches to development and governance, geared toward strengthening its political institutions by nurturing its democratic stability, safety and openness to the world, provided a crucial foundation and head-start. Brand Costa Rica is well-established and respected. Companies build off the image of a progressively open and ecologically integrated destination. But maintaining and advancing this model requires ongoing efforts. New challenges are emerging. Protectionist rhetoric and politicking, apparently in the interest of preserving the “social contract”, is just one of many threats to the delicate Costa Rican balance. Costa Rica is well positioned to leverage off its achievements in a world where investors are increasingly seeking returns alongside social and environmental progress. Herein lies the true takeaway for African countries seeking inclusive growth, sustainable development and foreign investment in more productive sectors. An extra dimension of services and quality can add substantial value to resources like agriculture. This can be done alongside high-end manufacturing and exclusive services in business, medicine and tourism. It is essential to remain open and connected. The movement of people is key, whether they are tourists or investors. Politics needs to keep pace with commerce. And political institutions should guide, support and nurture this model, starting with democratic values and broad-based stability. Prof. Lyal White is the Senior Director of the Johannesburg Business School (JBS) at the University of Johannesburg. 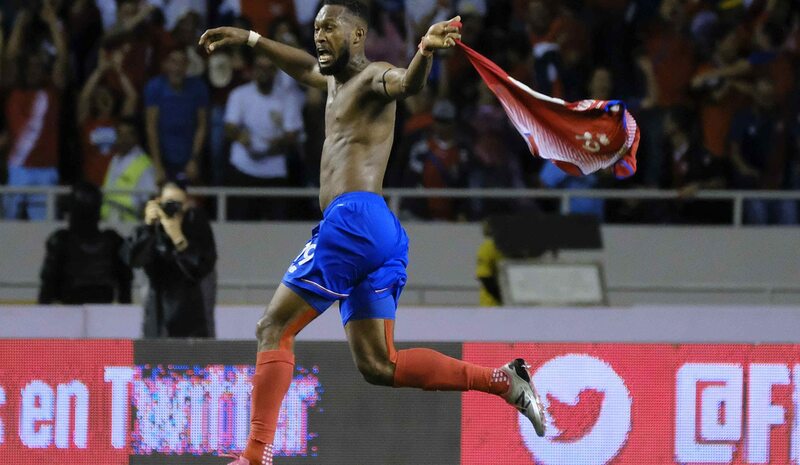 Photo: Kendall Waston of Costa Rica celebrates after scoring against Honduras during their qualifying match of the 2018 FIFA World Cup Russia at National Stadium in San Jose, Costa Rica, 07 October 2017. Photo: Jeffrey Aguedas/(EPA).